Avian influenza (“bird flu”) is a viral illness commonly found in certain wild bird populations, most notably waterfowl and shorebirds. Wild birds may carry a variety of avian influenza (AI) viruses and most strains do not cause clinical signs of illness. Few AI viruses are able to infect humans, but influenza viruses are highly dynamic and change over time. Occasionally, AI viruses change into forms that are deadly to domestic chickens and turkeys. These viruses are known as highly pathogenic avian influenza (HPAI) viruses, and the designation of “highly pathogenic” refers to its effect on domestic poultry, not humans. In December 2014, HPAI strain H5N2 was detected in a poultry farm in British Columbia. 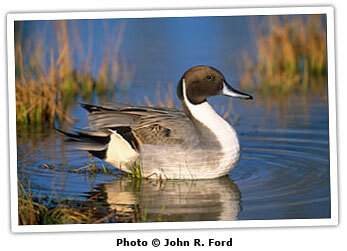 Since then, H5N8 and H5N1 have also been diagnosed in the Pacific Flyway. It is important to note that the new H5N1 strain detected in the Pacific Flyway is NOT the same H5N1 strain that was circulating in Asia several years ago. H5N2 virus has been detected in the Mississippi and Central Flyways in both wild birds and domestic poultry, but HPAI has not yet been detected in Virginia or anywhere else in the Atlantic Flyway. There is no immediate public health concern with any of the HPAI viruses detected in the Pacific, Central, or Mississippi Flyways since December 2014. Do not eat, drink, or smoke while cleaning your birds. Use rubber gloves when cleaning game. Clean all tools and surfaces immediately afterward; use hot soapy water, then disinfect with a 10% chlorine bleach solution. VDGIF staff have been notified to be extra vigilant for sick or dead raptors (hawks, eagles, owls), turkeys, and waterfowl (ducks, swans, geese). If you see a sick or dead raptor (excluding carcasses found on the road) or turkey, please notify VDGIF via the Virginia Wildlife Conflict Helpline at 855-571-9003. If you find five or more dead waterfowl in the same area within 1–2 days, please notify VDGIF via the Virginia Wildlife Conflict Helpline at 855-571-9003. If you find a dead song bird(s) or suspect that one of the species listed above died of trauma from hitting a stationary object (window, powerline) or moving vehicle (found on or near a road), or by predation (cat), do not call VDGIF and safely dispose of the bird using the guidelines below.